The Victor Stello, Jr. Award was established by the DNFSB to be given to an employee of the Department of Energy who demonstrates exemplary leadership in promoting safety management in the DOE defense nuclear complex. 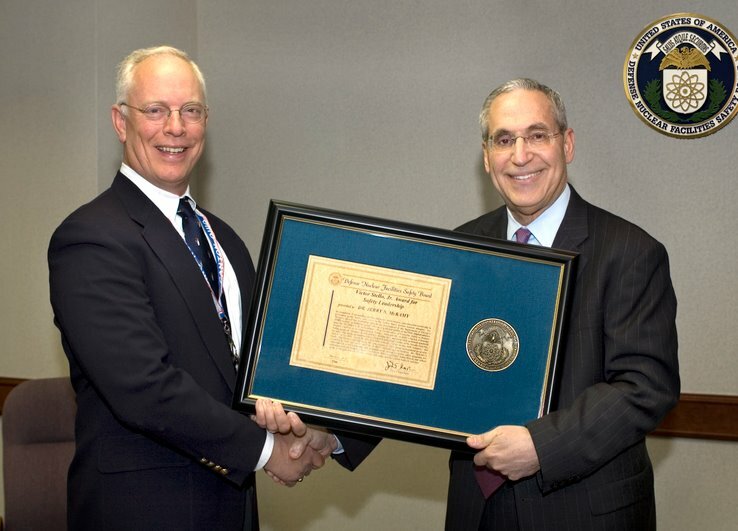 The award honors Victor Stello, Jr., Principal Deputy Assistant Secretary for Safety and Quality, Office of Defense Programs at DOE, in recognition of his outstanding service, exemplary performance and admirable leadership in promoting public health and safety in the Atomic Energy Defense Activities of the United States. Dr. McKamy has been instrumental in addressing the issues raised by the Board in Recommendations 93-2 and 97-2, and both furthered the safety objectives of the Board and enhanced criticality safety within the Department of Energy. As manager of the Rocky Flats Safeguards Measurements group, Dr. McKamy developed and implemented the Rocky Flats nondestructive assay program to measure plutonium holdup in ventilation ducting. Dr. McKamy was one of the principal authors of the DOE Implementation Plan drafted in response to Board Recommendation 97-2. For the past several years, Dr. McKamy has served as the DOE Nuclear Criticality Safety Program Manager (NCSP). Under his leadership, the criticality safety infrastructure within DOE has improved dramatically. His noteworthy accomplishments included ensuring budget requests were sufficient to fund criticality safety training courses, developing several DOE Technical Standards related to criticality safely, leading efforts to establish a new Critical Experiments Facility (CEF) in the Device Assembly Facility at the Nevada Test Site, directing and participating in criticality safety program reviews at several DOE sites, and contributing to revisions of DOE-STD-3007 and to DOE Order 420.1 B which put into place recognized standards without further modification and delay. Most recently, Dr. McKamy's superior leadership and management skills were recognized by the DOE senior management when he was detailed to fill the vacant position of Deputy Manager, Y-12 Site Office, Y-12 National Security Complex. It has been the experience of the Board that the essential element to solving highly technical management and leadership issues within the DOE organization is the assignment of a technically competent and highly motivated individual. In a discipline that the Board has repeatedly highlighted as essential to safe nuclear operations, Dr. Jerry McKamy has distinguished himself among a skilled DOE cadre as the best example of these qualities. He has exemplified those qualities for which the Victor Stello, Jr. Award for Safety Leadership was intended and is therefore well deserving of this special recognition.